Farmers’ Market is back on the Plaza. My work for the market has already finished for the year. Like most good things in life, my association with the North Coast Growers’ Association was a very organic process. Gardening for me isn’t all that much different from bowling – I throw the ball down the lane and sometimes I get a strike – or not – or, just as probable, a gutter ball. A blissful lack of technique or practice. So I was was blessed, during the two years I spent living in Mike and Kenzie’s converted chicken barn on Bay Street in Eureka, with two years of my own amazingly fruitful vegetable patch. In the 20 some-odd years since then I haven’t been able to replicate that feat, so I will have to chalk it up to the umpteen generations of chickens that hallowed that soil for decades preceding my arrival. Late in the fall of the last year I lived there I awoke to an early morning fog pierced by a determined sun over my frost-covered garden. It was such a momentary light that I jumped out of bed naked, pulled on just my boots, grabbed my point and shoot film camera and tried to capture some idea of what that moisture and light was doing as it played on my now decomposing garden. When the Instamatic photos, shot right into the sun, came back from the printers they were bleached out remnants of what I had experienced. As always, when I began painting from one of them, I tried to recreate what I saw and felt at that moment. 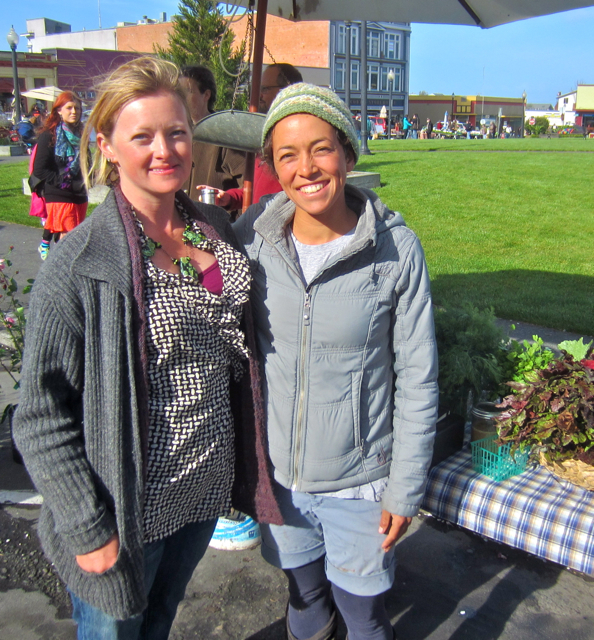 Farmers Jayme Buckley and Leandra Lopez of Bayside Park Farm. I had just spent the previous six months bemoaning the concrete behemoth that Church of the Highlands had just erected across the slough from me. Its cross in the sky with attendant floodlights had obliterated my precious dark night sky – and I had called several times in protest. As I worked on the painting, it began to clarify my views on religion/spirituality. The painting was of a jumble of sunlight coming down, water rising and falling in a mist, plants ascending and plants falling back into the Earth. It became everything that the floodlights on the cross were not – everything that the space program and capitalistic insistence on growth were not. The painting became to me an acceptance of our place on Earth and in the universe – a longing for nothing more than to have been a piece of a healthy living system. I realized that I had no desire to ascend to some heaven or to blast off to distant planets. My god became the god of the rotting and decomposing as much as the growing and the flowering. A god who disdained the lot of crazy prophets writing “holy” books. My god told us all we needed to know in blades of grass or summer storm clouds — and gave us a perfect place to live and the ability to perceive that miracle. That’s enough for me. After finishing that painting, and several others from my descending garden, I started seeing – really “seeing” – other gardens. And I started painting them and then consciously looking for other vegetable gardens to paint. Eventually, I began to know some of the serious farmers within the Arcata/Eureka area and it seemed that many of them had lived for a long time with that same acceptance (or worship of a sort) of the Earth and its bounties and its limitations. They have a knowledge of what they can ask of the Earth and what they must constantly give back to the Earth. They know that weather matters – that soil is not dirt, but a living organism. They live outside of the pathetically human idea that we can somehow cheat nature. 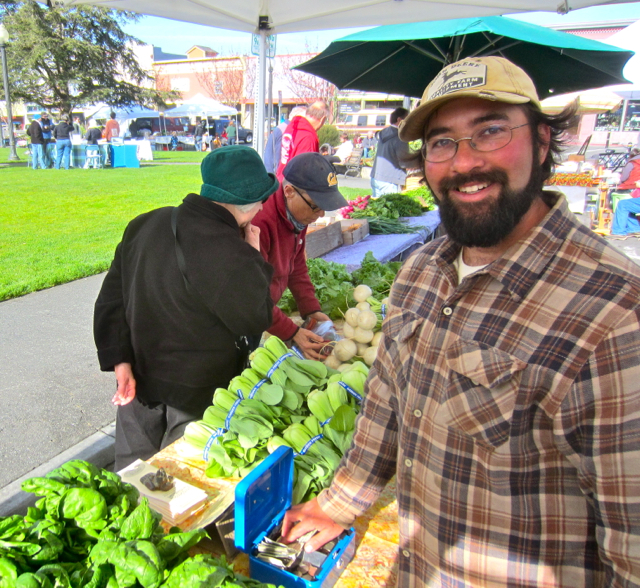 Farmer Eddie Tanner of DeepSeeded Community Farm. In Hocus Pocus, Kurt Vonnegut Jr. writes about a perpetual motion machine collection under a sign reading, “The Complicated Futility of Ignorance.” These machines are finely constructed from beautiful materials, and Vonnegut wonders if their makers must have thought they could overwhelm the laws of nature with fine craftsmanship. I feel that this paragraph encapsulates much of what we call “human progress” – a blind desire to make life “better,” without the wisdom to first think about what “better” really is. Just like the creators of perpetual motion machines, much of mankind has refused to accept some indisputable facts – like, we were made on and for this one planet, and this planet is the only sustainable home humans will ever have. Our local organic farmers, I think, are on the front lines of acknowledging and facing that reality. For two or three years, a good part of my watercolors were of local farm scenes. At some point Deborah Musick, who was on the NCGA board, asked if they could use one of my paintings as an image on the annual farmers’ market poster. And then the next year and the next. Then, when t-shirts and tote bags started selling, they actually started paying me for using the images. The longer I work at art, the more I realize that discipline and persistence are the most important aspects for success. Vision is only as good as the patience necessary to nurture it. I would say the same applies to farming, but much more so. Not only is day-to-day, year-after-year commitment an unavoidable prerequisite, but it’s challenged constantly by joints that ache, by the whims of untimely storms and frosts and heat, and by markets and the price of gas. And the inevitable wrong decisions that a grower makes can’t be erased or painted over – it can result in a whole season of a lost crop. The fact that any farmers make it into their second or third year of their career is even more amazing to me than the fact that some middle-school teachers do. Some people look at art as magic. Given my pathetic attempts at growing food, I look at good farming as magic. I look at the small organic farmers of our watershed as artists who understand better than most of us the magic of living on Earth. I see at them as healers of the wounds and toxins left by decades of industrial farming. I marvel at their integrity, and am always grateful that they have the desire and the wisdom to put that integrity to work in a way that benefits us all. 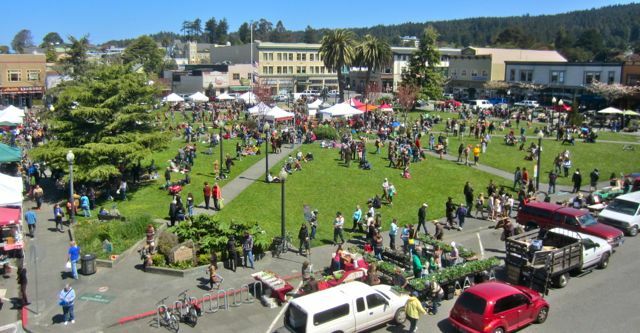 I think a lot of us long-time and newly-arrived locals can agree that there isn’t much “better” in the world than homegrown music wafting over the Farmers’ Market on a sunny, late spring day. Most of that atmosphere, though, originates with the open attitude of those who bridge that distance between the soil and the shoppers. It’s an atmosphere created by people who work hard and who believe deeply in what they are doing. On the surface, good whole food is a simple gift. But digging deeper, it is rooted in patience, knowledge, hard work, wisdom, humility, acceptance, gratitude – the very best of both humanity and the Earth. Alan Sanborn is an Arcata artist and father. This entry was posted on Wednesday, May 1st, 2013 at 2:00 pm	and is filed under Opinion, Community, Business, Health. You can follow any responses to this entry through the RSS 2.0 feed.